Wigan Warriors have re-signed England international Dan Sarginson on a two-year deal following his release from Gold Coast Titans. The 24-year-old returns to the UK after one year in the NRL, which was cut short by a shoulder injury, restricting him to only five appearances. “I can’t wait to get back to the club I have so many fond memories with, including the greatest moment of my career, winning the 2016 Grand Final,” said Sarginson. “Although it didn’t work out the way I would have liked due to injuries, I’m glad to have had the experience of playing the in NRL. Sarginson scored 26 tries in 82 games for Wigan during his previous three-year stint at the DW Stadium. “Dan joined us as a youngster in 2014, who was relatively new to the game, and left us as a Grand Final winner and an England international,” said Warriors coach Shaun Wane. 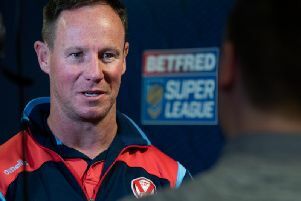 Executive director Kris Radlinski added: “We were recently made aware of Dan’s situation in Australia and acted swiftly to secure his return to Wigan. “Dan was phenomenal in the 2016 Grand Final and put in a performance that will live long in the memory.